Cassava (Manihot esculenta Crantz) is cultivated in almost all the tropical areas. It plays a key role both as a staple food and source of income for millions of people most especially in Africa. It therefore has the potential to reduce poverty, one of the indicators of which is food insecurity. In Africa, women farmers perform much of the work associated with agricultural production. Cassava, in particular, is considered to be a “woman’s crop,” with women engaged in most cassava production and post-harvest handling activities. However, there has been limited research conducted to reveal cassava production and processing preferences of farmers, especially women, which limits the adoption and usage of improved cassava varieties. With Next-generation breeding technologies helping breeders to speed up the development of new cassava varieties; it is imperative that we focus on the traits that farmers want to reduce the risk of developing varieties that will not be widely adopted by the farmers. 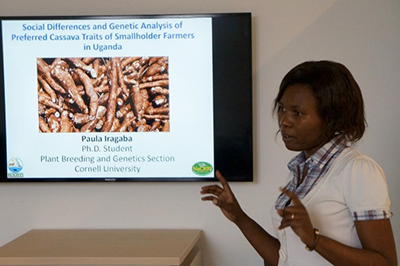 We are collaborating with Next-generation cassava breeding project in a study to understand the genetic basis of the preferred cassava traits of smallholder farmers and the design of appropriate breeding strategies; case study in Uganda. Specifically, we focus on 1) examining gender disaggregated cassava trait preferences for smallholder farmers in Uganda; 2) optimizing cassava phenotyping protocols to measure identified preferred traits; and 3) identifying marker-trait associations for the preferred cassava traits. We believe once cassava breeders get the right information on gendered cassava trait preferences and the optimized protocols for phenotyping these traits, it will aid in mainstreaming gender into the development of new cassava varieties. Funding: BMGF Nextgen Cassava and the CGIAR Roots, Tubers and Bananas Program.